Breakfast casseroles make a hearty meal any time of the day, but many rely on hash browns or bread cubes to bulk up the egg mixture. 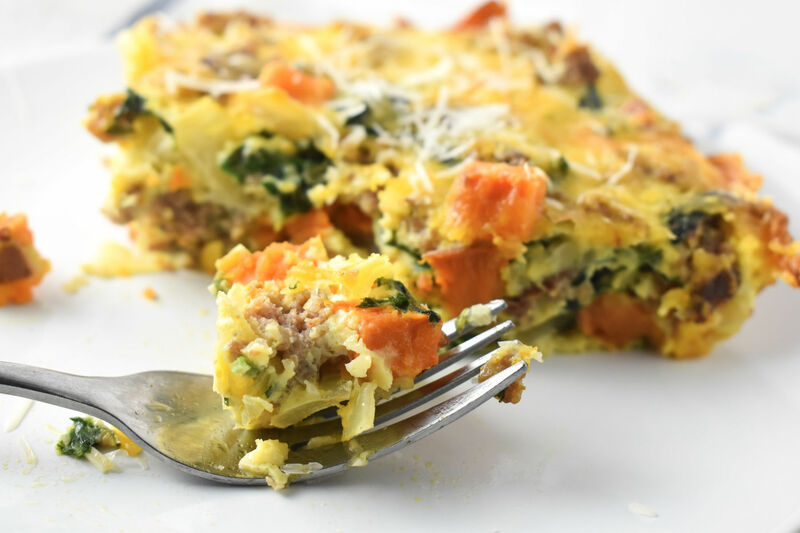 In Roasted Sweet Potato and Sausage Breakfast Casserole, white potatoes are swapped for more nutrient-dense sweet potatoes. Roasting caramelizes the natural sugars in the sweet potatoes and ensures that they’re tender. Adding a vegetable like spinach means fewer unhealthy carbs and gets in some leafy greens. Serves 8. Preheat oven to 425 degrees. Line a baking sheet with foil; lightly coat foil with cooking spray. Toss sweet potatoes with olive oil, ¼ tsp. salt and garlic powder. Arrange over prepared baking sheet. Bake at 425 degrees for 20 minutes, stirring halfway during cooking. When potatoes are done, reduce oven to 375 degrees. While potatoes bake, place a nonstick skillet over medium heat. Add sausage, stirring to crumble, cooking 5 minutes or until no longer pink. Remove sausage from skillet to drain, reserving drippings in pan. Add onion to pan drippings. Cook 5 minutes, stirring frequently, or until tender. Add spinach, cooking 1 minute or just until wilted. Combine eggs, milk, and remaining ¼ tsp. salt in a large bowl, whisking to combine. Add drained sausage, sweet potatoes, onions and spinach, and half of each cheese, stirring gently to combine. Lightly coat a 13-by-9-inch baking dish with cooking spray. Pour egg mixture into prepared dish. Sprinkle with remaining cheese. Bake at 375 degrees for 20 to 25 minutes or until set in middle. Calories 232; total fat 13g (saturated fat 5g); cholesterol 240mg; sodium 536mg; total carbs 12g (dietary fiber 2g, total sugars 3g, added sugars 0g); protein 16g.